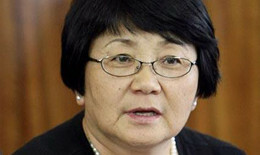 Roza Otunbayeva is the former President of Kyrgyzstan. She graduated in the studies of Philosophy from Moscow State University before carving a highly successful career in politics. Following her university studies, Otunbayeva chose to teach as a Senior Professor and become Head of the Philosophy Department at the Kyrgyz State National University for six years. She then made the switch to politics where she quickly rose in prominence in the Kyrgyz Communist party. In the late 1980’s Otunbayeva served as the head of Soviet delegation to UNESCO in Paris before making the transition to diplomacy as the Soviet Ambassador to Malaysia. In 1992 she was chosen to serve as Foreign Minister in the newly independent Kyrgyzstan, later becoming Kyrgyzstan’s first ambassador to the USA and Canada. In 2004 she was part of the group of former high-ranking establishment figures which founded the Ata-Jurt Party. In 2010 Otunbayeva was a key leader of the Tulip Revolution in Kyrgyzstan which resulted in the removal of President Akayev. She was then selected by opposition leaders to lead the Kyrgyz interim government and served as president until December 2011 when her term ended.